This guy here, by appearances an avid Broncos and Rockies fan, spectacularly failed to rob an E-Cig of Denver store in Colorado on Sept. 2. Fumbling his gun over the counter was a bad start, and failing to secure his pants was a bad follow-up, although he did redeem himself somewhat with a super cool karate kick to spur his getaway. According to Aurora PD, the thief used a fake gun, and nobody was injured in the attempted robbery—though they won’t know for sure until they catch the dude, since he may have strained himself on that kick. Not even the owner can resist laughing at this buffoon. 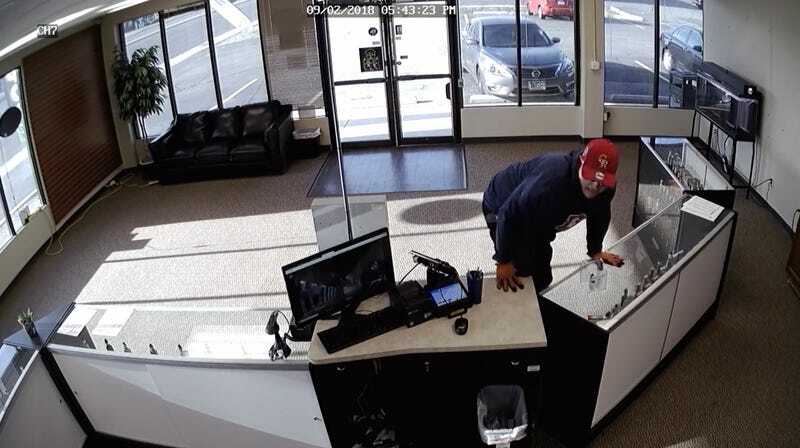 “I don’t want to downplay the seriousness of an armed robbery, but the guy really does belong in the ‘world’s dumbest criminals.’ He needs to find a new career,” said Chris Burgess, adding that he only kept about $100 in the register anyway. We asked Aurora PD whether they’ve caught the guy yet, and we’ll update you if they respond. Luckily for the dude, the Rockies won an afternoon game against the Padres that day, so he was able to see his team win before he fucked up his dumb robbery around 5:45 p.m.